Some of you were kind enough to respond to our work. Thank you so much for putting so much effort into the editing and final creation of our wedding video.We and our friends were extremely impressed with the way you seemed to manage to capture the very essence of what was for Sarah and I a perfect day. Sarah and I have watched it many times, even in the last couple of weeks, and we can honestly say it gets better and better every time we see it. I have finally had a chance to go through all the Video8 tapes that you copied/reformatted for me on to MiniDV. I just wanted to let you know that I am delighted with the quality of your work, especially given the age of the material and my previous experiences of its playback. Your customer service was also excellent, as you answered all my questions promptly and helpfully. I would recommend your service as very efficient and good value. I am pleased to say that I will not hesitate to use Crest Video again and would happily recommend you to others. We watched the video yesterday, and we really really liked it! We found it very moving in parts, and it captured the day and the evening really well. Rewatching the speeches was very entertaining!! We don't want to make any changes to it - its perfect! Thanks for all your time and patience in making this a great memory for us. Thank you so much for the fantastic wedding DVD - it is everything we ever hoped from it and more. We have been playing it almost continuously since we received it and are still finding new moments that you captured to smile at! ...........Thank you so much for managing to capture the flavour and atmosphere of the day so well. I am sure we will treasure this memory on DVD for years to come. The wedding video was excellent - it captured so many moments that we had missed and we were able to relive the euphoria of the day all over again. We were able to relax this time as I heard the speeches without worrying about what they were going to say! Many thanks. Mahesh and Vin were so discreet and helpful that it was a pleasure sharing the day with them. The end result was fantastic. 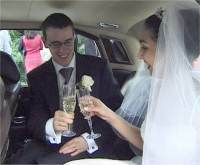 We highly recommend getting a wedding video and using Crest who are so reliable and Conscientious . Everyone who has seen the wedding video has loved it and have been really impressed, in fact a friend of ours who is getting married next year may be giving you a call soon! Thank you so much for our wonderful Wedding DVD/video, Mark and I are so happy with the final result. Thank you again for giving us such a great memory of our day. Thank you for making our wedding video so special. Thank you both for filming our wedding. friends who have seen it said the same as well. I think everyone is going to be trying to book you in the future. A number of people have already asked for your number. You have turned what was a really special day for us into a lifetime memory and we are so grateful for that. Thank you very much for filming our wedding and turning it in to a wonderful memory of our very special day. Czarina and I would like to thank both you for your time and efforts in making a fantastic video of our special occasion. It is a perfect memory of the day and we shall treasure it for our lifetimes. I will have pleasure in recommending your services to all of our colleagues and friends and look forward to using your services ourselves in the future. We would highly recommend Crest Video to be the videographers for your wedding. Mahesh and Vin were professional, friendly and unobtrusive, and made us and our guests feel at ease about being filmed. They were very obliging with regards to any changes we wanted made to the edit, and we were delighted with the end product. A bit belated but a million thank yous for a wonderful wedding video. We are so happy with the end product, and you both made the whole process very pleasant and stress free. Definite recommendations from us! Thank you very much for the lovely video you produced for our wedding. It is very good and picked up all the important bits we wanted. We very much enjoyed having you at our wedding. You were very professional and unobtrusive but friendly and joined in the spirit of the day. We had a wonderful day and are so pleased to have captured the special moments on video.